I have just opened my free Spotify account and thus I spent a little time on that streaming music platform. I immediately thought about opera on spotify and I had the idea of comparing the presence of some of my favorite sopranos on that service. 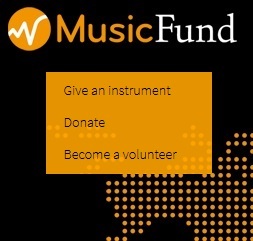 So I have searched for Cecilia Bartoli, Anna Netrebko, Edita Gruberova Angela Gheorghiu, Maria Callas, Renata Tebaldi, Dame Kiri te Kanawa, Dame Joan Sutherland, Mady Mesplé and Victoria de Los Angeles. I was eager to see who has the larger audience on that service. I thus watched who was the diva who had the most listened track! The search led to both expected and surprising results! Duet of flowers ranks very well! 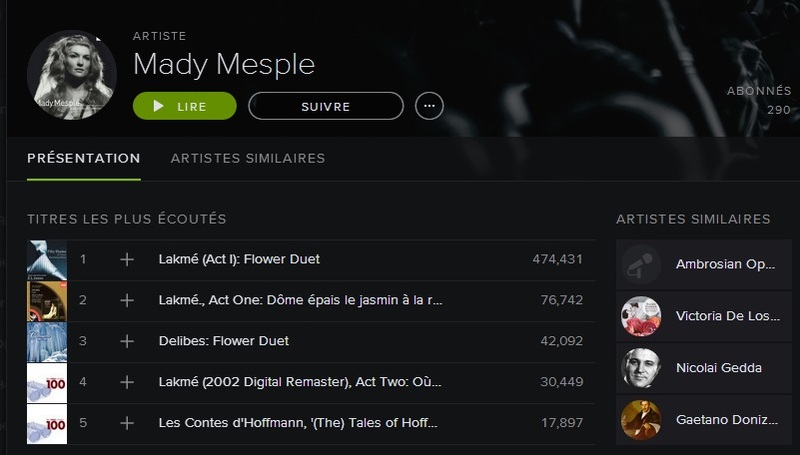 Because it is included in the Classical Selection of the author of 50 Shages of Grey (http://www.eljamesauthor.com/gallery/soundtracks/), French Soprano Mady Mesplé (with Danielle Millet) rocks! 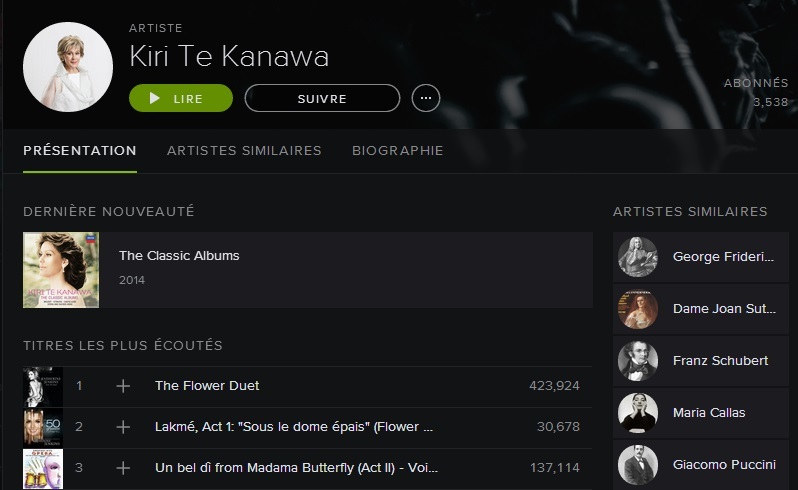 Another version with Dame Kiri Te Kanawa (with Katherine Jenkins) has also more than 400 000 listenings. 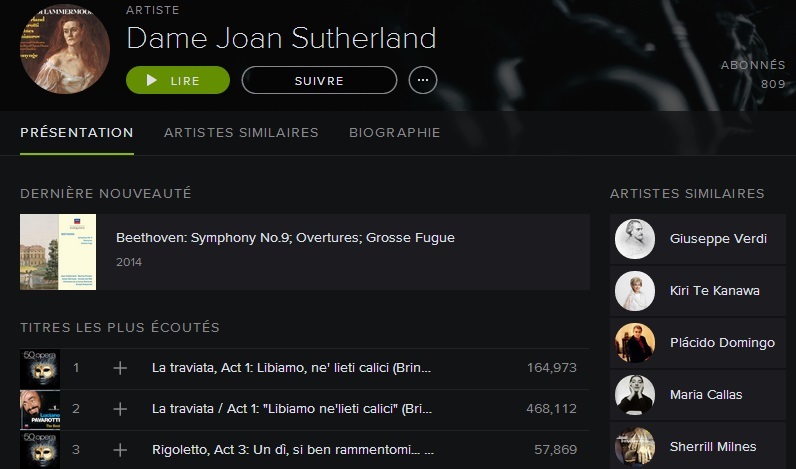 Dame Sutherland has a good position thank to a track from la Traviata (Il Libiamo with Pavarotti); It was listened more than 460 000 times. Another key result of this quick search, is how strong Puccini is! Verdi comes after! 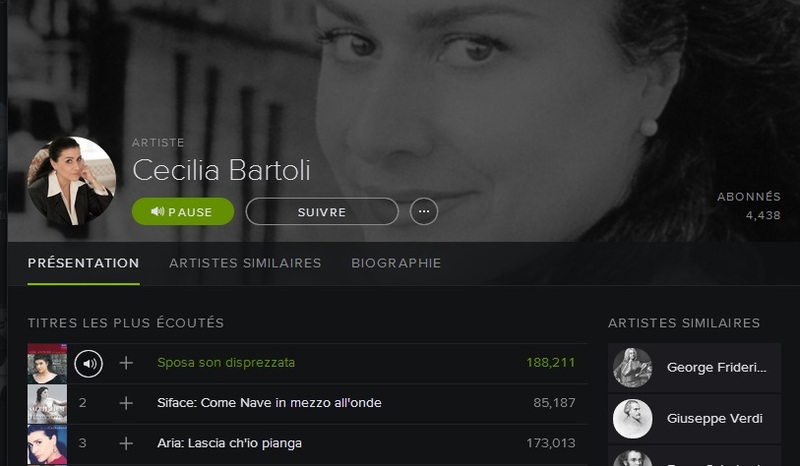 I must admit than Puccini reign over opera audience on spotify ! Puccini often appears in top of main Sopranos and O Mio Babbino caro is a must-have This aria is amongst the first three tracks in terms of audience for Renata Tebaldi, Maria Callas, Anna Netrebko, Victoria de los Angeles! 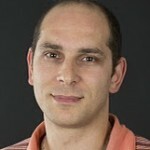 This entry was posted in digital & classical, Number of the week and tagged diva, soprano, spotify by Ramzi SAIDANI. Bookmark the permalink.